Knopf Books for Young Readers, 9780375840029, 40pp. A delightful book to read out loud with children who are just learning their ABCs. It's sleepy time in Alphabet Town. But the twenty-six little letters of the alphabet all have something they need—or want—to do before BIG-letter moms and dads tuck them in. Not since the classic Chicka Chicka Boom Boom has there been such an appealing way to teach the youngest child the ABCs while providing a one-minute goodnight story. 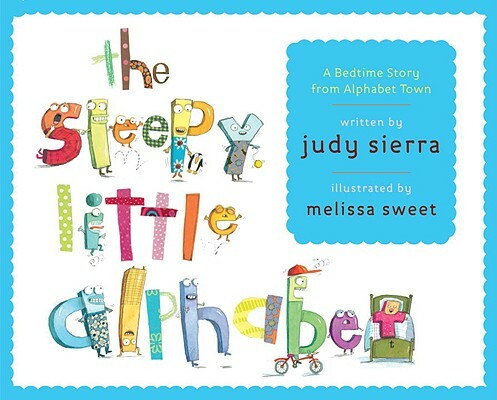 Of course, Melissa Sweet’s animated watercolor, pencil, and collage illustrations may beg for a little more time to match up all the toys with the right letters, and Judy Sierra’ s rollicking rhymed story will want to be heard again and again. Okay, so maybe it’s a three-minute story! Judy Sierra’s knack at telling stories in rhyme is impressively demonstrated in her E. B.White Read-Aloud Award winner, Wild About Books; in Born to Read; and in Thelonius Monster’s Sky-High Fly Pie. She lives in Eugene, Oregon. Melissa Sweet is the illustrator of many acclaimed children’s books, including her collaboration with Judy Sierra on Schoolyard Rhymes. She is also the author and illustrator of Carmine: A Little More Red. She lives in Rockport, Maine.